We celebrate Mommy's birthday every year as she really looks forward to it. This year was extra special as it was a milestone birthday. We planned a program for her which included dance numbers from my sister Marisa and myself. Our numbers brought the house down but nothing close to when Mommy did her number. The party place rocked and rolled when Mommy Inday Carmona was led to the dance floor by her three Dance Partners, Jimmy Jumawan, Rey de los Reyes, and James Borja. The three dance partners conceptualized a number which was a combination of boogie, twist, hip hop, pachata and reggae. But the "piece de resistance" of her number was when she got lifted in the air! I was a basket case of emotions- I was screaming, laughing, crying- I was hysterical really! I realized that it was a moment of triumph for Mom as it validated her passion for dance which she started 37 years ago with her Dance instructor, Boy Balani. For 35 years she continued to dance with him until two years ago when he fell ill and had to stop dancing. But Mommy wanted to continue dancing so we chose 3 different dance partners to dance with her on different nights of the week. Through the years, we saw her take different roles in their club's big affairs (Mom joined Supremes, Smiles, Circle) like Valentine Queen (Valentine Ball), Salsa Queen (Latin Night), Roman Goddess(Roman Holiday Night)etc. These theme parties raised her adrenalin to the Max and inspired her to look beautiful and slim always. She got us involved in her theme parties as she would always ask us to plan her costumes and invite us to attend with her. Daddy was very supportive of her ballroom dancing as he realized that this was what kept Mommy healthy and fit. Now that she is a "Nonagenarian", we are so proud to say that she has very minimal health concerns and she credits this fact to her dancing years. Doctors will tell you that dancing has indeed a treasure trove of health benefits like: improved mental functions, improved condition of the heart and lungs, increased muscular strength, motor fitness and endurance, improved balance, flexibility and spatial awareness, stronger bones and reduce risk of osteoporosis, improved general and psychological well being, weight management, increased physical confidence, greater self confidence and self esteem, better social skills. Cheers to our the Dancing Queen, Josefa "Inday" Carmona, may she have more dancing years to come! 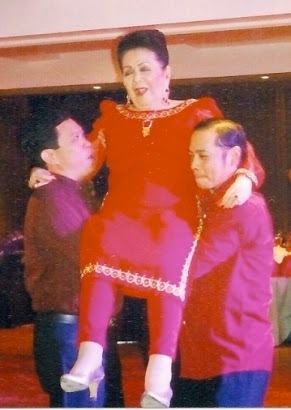 Up in the air, Birthday Queen, Inday Carmona ! James Borja and Jimmy Jumawan. Shake, rattle and Roll, Mommy! international dance competitor Ryan Jago. Make a wish, Mommy dearest!